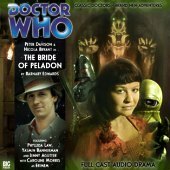 Appearances: "The Curse of Peladon", "The Monster of Peladon", and "The Bride of Peladon"
History: Although the Aggedors are essentially animals, they have nevertheless been important allies to The Doctor when the situation calls for it, The Doctor himself referring to Aggedor as an old friend on more than one occasion. The sacred beast of the distant planet Peladon, Aggedors were regarded as a symbol of hope and the protectors of the Peladonian royal family for several centuries, ever since an ancient Peladonian king fell down a cliff and was saved by an Aggedor ("Legacy"). In appearance, the Aggedors could best be described as large furry warthogs with paws and a single horn in the centre of their foreheads, possessing a keen sense of smell to compensate for poor eyesight as they tend to live in the caves of Peladon, with large teeth and claws and vicious tempers, although they have been known to be rather gentle to those they consider friends. However, they were believed to have been hunted to extinction long before The Doctor’s first visit to the planet, with no Aggedors having been seen for years before The Doctor arrived. When the Third Doctor and his companion Jo Grant arrived on Peladon while testing the apparently-repaired TARDIS - although it was later revealed that the Time Lords had sent The Doctor there to indirectly help Peladon at a crucial point in its history - ("The Curse of Peladon"), they found themselves participating in a conference to determine Peladon’s admittance to the Galactic Federation, The Doctor posing as the Federation delegate from Earth to get a better picture of the current situation. In an attempt to keep his planet ‘safe’ from outside influences, High Priest Hepesh was using a surviving Aggedor that he had discovered in the tunnels underneath the palace to attack others, claiming that the spirit of Aggedor was angry at Peladon abandoning their old ways. However, this plan failed when The Doctor exposed his role in the attacks and tamed Aggedor, the creature’s subsequent attack on Hepesh serving as a public representation of the spirit of Peladon denouncing his allegiance to the old ways and a willingness to explore the possibilities of the future presented by the Federation. Returning to Peladon fifty years later, The Doctor - now accompanied by Sarah Jane Smith - discovered that the people of Peladon were being attacked by what appeared to be Aggedor’s spirit ("The Monster of Peladon"), believed to be a punishment for the increased role that aliens had in Peladonian society. Fortunately, The Doctor was not only able to expose this illusionary Aggedor as nothing but a holographic projection that could generate fire - later using this weapon against its creators, a renegade group of Ice Warriors -, but even discovered the real Aggedor, now significantly older but still willing to consider The Doctor a friend after The Doctor used a Venusian lullaby he’d previously used to tame Aggedor. With the conspiracy exposed as Engineer Eckersley, the head of Peladon’s mines, trying to take control of Peladon’s mineral wealth, Eckersley tried to escape by taking the Peladonian Queen Thalira hostage, but The Doctor was able to find and rescue Thalira with Aggedor’s assistance, although Aggedor was tragically killed when he moved to protect Thalira from an attack by Eckersley. Despite the death of Aggedor on this occasion, when the Fifth Doctor returned to Peladon a century later - the Seventh Doctor paid another visit between these two occasions as part of a plan to keep Peladon out of a future war with the Daleks ("Legacy") -, he and his companion Erimem discovered another Aggedor, apparently the offspring of the Aggedor The Doctor had known originally, The Doctor quickly befriending this Aggedor just as his past self had befriended her father. Investigating current events on Peladon, The Doctor learned that Sekhmet, a renegade Osirans ("Pyramids of Mars"), was attempting to escape her centuries of imprisonment by using four royal females to break the blood seal keeping her confined, with the chosen ‘sacrifices’ including Erimem, a former Pharaoh, and princesses sent from the Ice Warriors and Earth. However, The Doctor was able to contain Sekhmet thanks to Erimem secretly poisoning her blood before she was used to unlock the last seal, Aggedor helping The Doctor and his friends break down the doors leading to Sekhmet’s tomb in time to rescue Erimem and bury Sekhmet. As The Doctor departed, he was pleased to note that Aggedor had actually given birth after over a century of pregnancy, the new Aggedor pups representing a new hope for Peladon’s future as Erimem remained on the planet to become its queen.